Welcome to Raghnailt in Eich Moors! 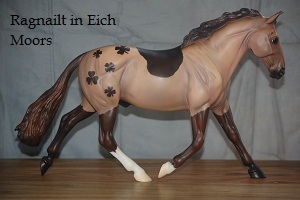 Hello and Welcome to Raghnailt in Eich Moors, a MODEL horse stable that is owned and operated in New York. This site for horse breed research and pedigree research purposes only. The use of real horse names and information is for educational purposes. We are in not in the business of upsetting the horse world. If you have a horse on these pages and wish it to removed, please contact me. This site is purely for educational and personal-interest needs. We are in the business of educating about horse breeds, genetics, coat colors, and famous and influential mares and stallions. We are proud to announce that we have over 1,000 great model horses at your fingertips to look at and for your breeding needs. We also compete in live shows, photo online shows and participate in the model horse world via the Model Horse Blab, IPABRA, Region Ten NAMHSA, IMEHA and the Model Horse United Facebook shows. Please note, this is a MODEL horse stable page, if you would like to learn more about what we do, please click on the "Learn More" tab on the drop-down menu above. All models have either straight model-breeding or, when possible, real horse lineage. Any models on here with any correlation to a real horse is noted, if not, then it is purely coincidental. No horses on here are SIMs or real horses. Any horse's pedigree which is by a real horse is designated with "(R)" after the name. We do not use any lineage which may be made up, we use only real horse or model-bred (Model-bred will trace back to real horse pedigree lines). If you have any questions, please send them on to us! We will be happy to answer them for you! We are proud members of the IPABRA, who are a majority of other model horse pedigree stables that have joined together. We are also proud members of the Region 10 NAMHSA showers and collectors! We are almost ready to be breeding out into the public as we are working to get more horses available to the public! Please stay updated with us! And find us on Facebook! We also do a lot of breed research for our showing and pedigree purposes. A lot of the breed and photo research can be found on the Blogger site: remoorsfarm.blogspot.com. It may take some time to update pages. Please be patient if things are not updated right away. Not all of our horses are live show quality, there are some who live on the shelf. But this does not mean they are any less important to us. We do have some that are BSOs (Breeding Stock Only) but that is to ensure our models have quality pedigrees within the years we are looking for. All BSOs will eventually have a body to go with it. We are not allowing breedings for producing BSOs! Raghnailt in Eich Moors originally was named Shamrock Stables and their horses were designated before their name with "SS." Shamrock Stables still exists within the owner, but after having been on break from the models since 2005, we are re-opening as Raghnailt in Eich Moors and all horses are being designated with "RE" before their name. Why Raghnailt in Eich Moors? Raghnailt in Eich is Gaelic, as the owners are of Irish blood. The word Raghnailt means strength, with Eich meaning horse. The name is essentially "Strength of the Horse" with moors being the typical landscape one will see in Ireland. Not to confuse readers, the stable is located within the United States. We have a wide variety of horses to choose from, Abaco Barbs to Zebras and everything in between, including Mythical! We buy the best stock, from large to micro, and from live-show quality to those who just need a forever home on the shelf. Others might get a make-over should they have a twin in the herd.